Vortex 50/50 Draw! Prize: 560,000g! With Antorus in full swing and the downfall of Mythic Argus on the horizon, it is time to replenish the guild bank! To keeping makin' it rain, we will be holding our next installment of the Vortex 50/50 draw on Thursday, April 26th! All Tickets must be purchased before 7:00pm Thursday, April 26th, 2018. The draw will take place at 7:45pm on April 26th right before raid. All are encouraged to get in mumble as the draw happens. If you are unable to attend the draw and you win, your winnings will be mailed to or traded to you. Re: Vortex 50/50 Draw! Current Prize: 87,500g! Get your tickets in. Current prize 87,500g! Come on everyone! ITS FOR THE CHILDREN! Re: Vortex 50/50 Draw! Current Prize: 147,500g! Re: Vortex 50/50 Draw! Current Prize: 222,500g! Re: Vortex 50/50 Draw! Current Prize: 295,000g! 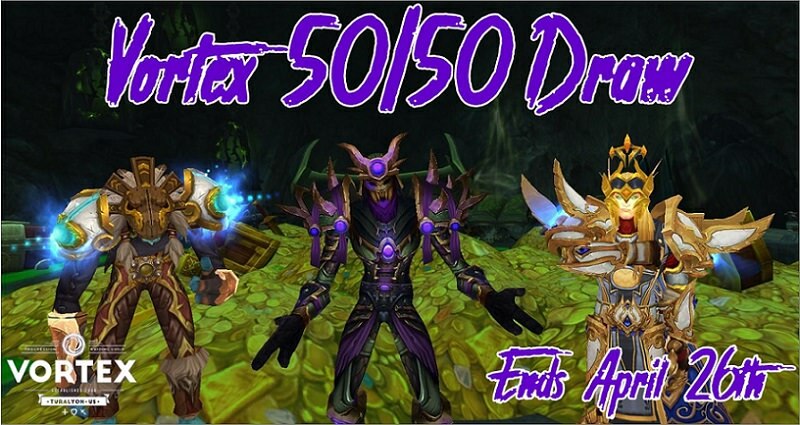 Re: Vortex 50/50 Draw! Current Prize: 300,000g! Re: Vortex 50/50 Draw! Current Prize: 360,000g! The prize is currently up to 360,000g. Reminder that any remaining tickets need to be purchased by 7PM Eastern Time (1 hour before raid start) on Thursday. Re: Vortex 50/50 Draw! Prize: 560,000g! Due to some EXTREMELY late last minute bids, the pot increased to 560,000. Congratulations to Mox, our winner!